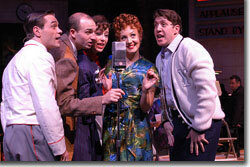 The 1940's Radio Hour: "Hello Mr. and Mrs. America and all the ships at sea ..."
as Ginger, and Matthew Dailey as B.J. Like Walter Winchell's famous sign on, the world's first mass electronic medium—radio—was a wonder to all who heard it. 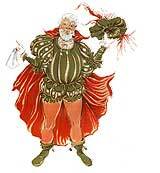 Perhaps it's the way in which sound stimulates our imagination that made the new technology so irresistible. We are, after all, a species that communicated through speech and song long before the invention of the written word. doing sound effects (foley artist). According to the late, noted media guru, Marshall McLuhan, the proliferation of radio returned us to this auditory-centered world and brought a sense of tribalism to global audiences, who gathered around consoles filled with tubes and widgets, which received the broadcast transmissions from afar and converted them into sound. In those days—before TV, email, Facebook and Twitter—serial comedies, dramas, variety shows, and musical samplings from every genre filled the airways, bringing together folks from crowded cities and remote rural settings, and making stars of those whose voice, musical talent, or comedic sense stood out from the norm. For those who grew up then, and for those who enjoy radio today, The 1940's Radio Hour magically recreates the spirit of that time—through descriptive narratives, distinctive vocals, a fabulous big band, and clever sound effects—and invites us into the studio to experience a live production, with a host of colorful characters, and all the backstage intrigue that goes hand-in-hand with show biz. The show is the most popular holiday fare that the Arvada Center has ever produced, says artistic director Rod Lansberry. "Part of it is because of the nostalgia and how deeply you can get into the characters, watching the re-creation of a live radio show. The characters are so unique." There is the dyspeptic announcer and general manager, the lead singers that emulate the great male and female vocalists of the day, the established band leader, the upcoming talent, a musician and a singer looking for their big breaks, the bobby-soxer and the preppy, the big shot sound effects guy, and the tech wiz. 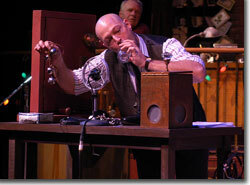 In the world of the play, folks at home believe they're listening to the evening's entertainment from the Hotel Astor's Algonquin Room, but the theatre audience sees the studio of mythical radio station WOV and what goes on behind the scenes at its weekly "Mutual Manhattan Variety Cavalcade." It's December 21, 1942—an uncertain, but heady, moment. 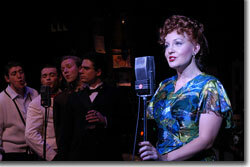 Bev Newcomb-Madden, who is directing The 1940's Radio Hour for the third time, suggests that "... it's something to look back on, nostalgically, and see where we were as a nation at that time, and how individuals reflected their sincere, honest feelings about what was going on with the war." The United States was a much different place then, she points out: "There was an innocence that we no longer have as a nation. There was this idea that we were all in this together. And there was a patriotism that was constant, which is reflected in this show, without being overdrawn." 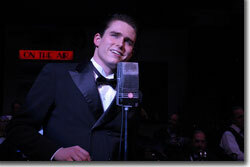 Other than the war, which looms large in the background, the drama stems from the personal lives of the characters, who remind us of people we know: Johnny Cantone, a boozing Italian crooner who's looking to turn around his once bright, now plummeting career in Hollywood; the bubble-headed comedienne; and even the likes of the bookie by day and stage doorkeeper by night. And then there is the music, which Newcomb-Madden remembers well: "There was no television—so we relied on radio for entertainment, and I was one of those kids during the war that loved to hear the music of Glen Miller, Tommy Dorsey—all of the big bands—and had their records, 78s, and I had a record player and would play these records over and over again." 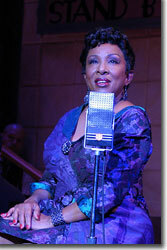 Many of the most popular recordings from the era are covered by the cast of the radio show and the live, 12-piece house band, including the Andrews Sisters' "Boogie Woogie Bugle Boy," Duke Ellington's "Don't Get Around Much Anymore," the Judy Garland and, later, Frank Sinatra hit, "Have Yourself a Merry Little Christmas," the Harold Arlen/Johnny Mercer classic, "Blues in the Night," the George and Ira Gershwin standard, "Strike Up the Band," Rogers and Hart's "Blue Moon," and Sammy Fain and Irving Kahal's "I'll Be Seeing You." At the time, these and other hits were featured every Saturday night on Your Hit Parade and sung by dozens of well known singers over the years on the NBC radio network. 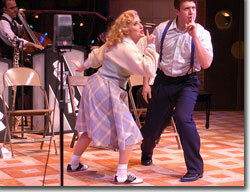 With all this great music, it's easy to understand why, at times, the characters can't restrain themselves from cutting the rug with a wild jitterbug, a flashy tap number, or the Lindy. The country was dance crazy! Contests popped up everywhere and folks came from miles around to compete or watch. Rewards and a measure of fame went to the best pairs. There were marathons, too, which went on for days, before celebrating the stamina of the last couple left standing. Newcomb-Madden had a lot of fun recreating the period, "... being able to cast people who are much, much younger, but who can reflect that '40's style of singing and the '40's style of acting; they have to make us believe that we're really there." Although "the greatest generation," as Tom Brokaw calls those who weathered both the Great Depression and World War II, continues to shrink, the show remains popular. 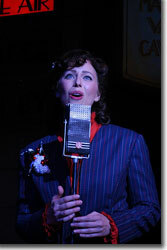 Since the original production ran on Broadway, at the St. James Theatre, in late 1979 and early 1980, The 1940's Radio Hour has been staged at over 8,000 theatres. So, sit back and relax and let the kids take you back. The songs tell you all you need to know. Someone dials in the signal ... the radio crackles ... and we're transported to another time and place. 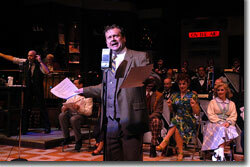 The Arvada Center's production of The 1940's Radio Hour runs at the Arvada Center through December 23rd. 720-898-7200 or www.arvadacenter.org.